The event will be marked by the installation of a new stained glass window of Our Lady of the Sacred Heart designed by prominent Catholic Aboriginal artist Kathleen Wallace. 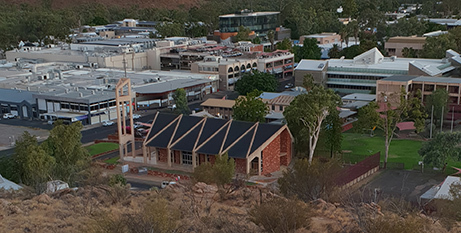 Said Fr Raass: “Our plans include minor renovations to the Church, but our biggest project is a special gift to the church building and community which recognises the religious cultural contribution of the Arrernte people. Fr Raass said the painting on canvas would be transferred to the largest window of the Church, behind the altar, using a contemporary stained-glass-making technique by Axess Glass in Melbourne, where the finished glass image is inserted between two UV protected panels for durability and strength against the extreme heat. And while the project has already gained some good financial support, the parish community is still raising funds for this significant project. “We are raising funds for the project and asking parishioners to sacrifice a cup of coffee or ice cream a week and offer it for this project,” Fr Raass said. Fr Raass said while the Church’s official anniversary is on May 11, this year’s celebrations and unveiling of the new stained-glass window had been scheduled for October 13, to allow for the completion of other minor renovations.